Got your trekking boots ready? Mount Fansipan is a great opportunity to put them to the test. 5 days of adventure and new experiences on overnight trains, hiking up Vietnam’s highest mountain - Mount Fansipan with spectacular scenery. 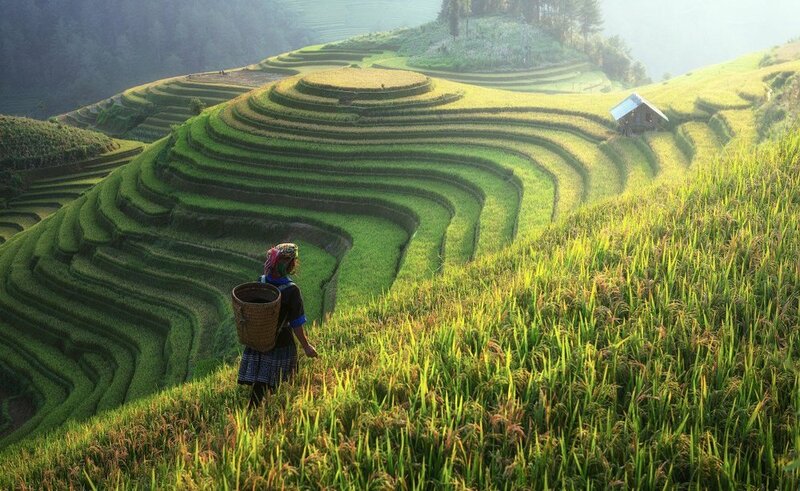 The highlights of the trip will be reaching the summit standing at 3,143m, being at one with nature and experiencing Vietnam on another level trekking the famous rice fields and learning more about the tribes in the area. This is the perfect trek for anyone wanting to try their hand at hiking and disconnect from the rest of the world. Tick your next mountain off the list in the beautiful world famous UNESCO site. UFIT Retreats are open to everyone - you do not have to be a UFIT member to join us on our escapes around the world. Vietnam entry visa. You can obtain a visa easily upon your arrival or purchase online beforehand. Your UFIT Retreats Manager will remind you multiple times, however you are responsible for getting your own visa. We depart from Singapore heading to Hanoi. Upon arrival we will be picked up by our awesome team to take us for the first experience to the Railway Station for the night train to Lao Cai where we will stay overnight on the train. The night train is a 4-soft sleeper with air conditioning and four bed shared cabin. The train will arrive at Lao Cai train station at approximately 06:00. There will be a vehicle waiting to transfer you to Sapa. The drive to Sapa is only 33km which will take around 1.5 hours. Once in Sapa, we will stop at the local restaurant where you will be able to freshen up and have a group breakfast. After fuelling up on breakfast, you will start the trip to conquer the roof of Vietnam and Indochina: Fansipan Peak. At about 09.30, you will head to Tram Ton Pass, you can visit the Silver Waterfall en route and Heaven’s Gate. We will be able to enjoy the wonderful scenery and then begin the trek to the base camp of the peak where we will spend the night. After roughly 6 hours of trekking through the primitive jungles, across the numerous small streams and bamboo forests. We will have climbed to about 2,800m where we will spend the night in your tent on the mountain after having dinner (please note this is basic accommodation). You will have breakfast at the camp and then head for the summit by way of pine and yellow bamboo forests. After an arduous 4-hours climb, you will finally conquer the roof of Vietnam and Indochina. Spend up to one hour enjoying breathtaking views of the splendid rolling mountains, the small villages of Lai Chau Province and the picturesque town of Sapa. After you have lunch, you will descend the mountain then travel to Sapa. This day will offer you a full day of activities with hiking and trekking. After breakfast, we will start trekking early from Sin Chai to Lao Chai and Ta Van Village, the homeland of H’Mong and Zdao people, where you can enjoy the most beautiful landscapes of rice terraces and mountains. After lunch in Ta Van, we will transfer to Ma Tra and take around 10 km to hike to Ta Phin and visit the beautiful villages and rice fields along the route. After that we will transfer to the station where you will have a quick shower and relax. Have dinner before getting on the train. Stay overnight on train. (Night train: 4-soft sleeper, A/C and shared cabin). We will arrive early in the morning from Sapa to Hanoi on the night train in time to transfer to Hanoi Airport ready to return back to Singapore at midday. Don’t waste another minute… get your explorer hat on and find out more information getting in touch with us!